Well here it is my long awaited 50th post...... I have been so busy this week and haven't had a chance until now to blog. Here is a parcel that landed in my post box this week. It is from the lovely Jenny. I just love it. Jenny is a beautiful stitcher. Jenny sent to me in Maree's Redowrk Cushion Swap. Isn't the cushion gorgeous? The candle is too - it smells beautiful. Here is the Redwork Cushion which I sent off to my partner. 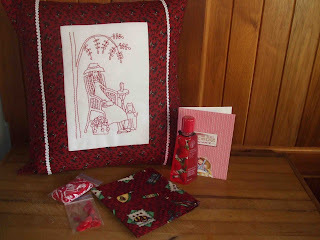 My partner, Pat, does not have a blog but she has sent me a lovely e-mail telling me that she had received the cushion and goodies so I am glad that they have arrived safely. 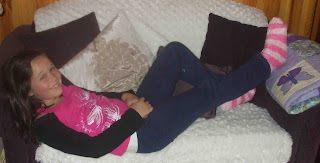 This is Amy (10Yo DD) the major reason for my busy week........ Amy has broken her ankle (Long Story) and is now in a back slab cast until the swelling goes down. We will get the verdict from the Orthapedic Surgeon on Thursday as to what happens next which is likely to be a full cast for 6 weeks. 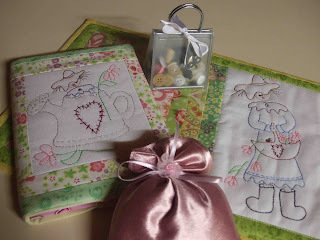 And here is the Spring Swap gift which I sent to my partner, Kris in Linda's Spring Swap. I made her a table runner and journal cover and sent a few other goodies. The shop development is going okay - Slowly but surely. It is totally lined now and the new wall is up along with the front glass doors. My next major task is to paint and clean. But I am off to the Quilted Crow's Autumn Gathering tomorrow so those tasks will have to wait until Sunday to be started. My new "web shop" is currently being constructed and hopefully will be up and running within the next few weeks. And now to my 50th post give away. It has come around so fast. 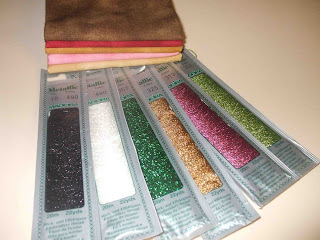 Here are 5 Blender fat quarters which will be stocked in my shop (when it finally opens) and also 6 packs of Madeira Metallic Embroidery Thread (Which I also have in stock) in some yummy colours. All comments will receive 1 entry. If you blog about my give away you will receive another additional entry. Overseas bloggers are welcome to enter - Good Luck to you all and thanks for making my first 50 posts fun and entertaining. I am off now to get ready for tomorrow's gathering - I must remember to pack my camera. For those of you that are going I am looking forward to meeting you. Congrats on the lovely gift. It looks beautiful. Oh your poor daughter. Its not nice to be laid up. Looks like she has a lovely quilt to rest her foot on. You have been so busy with all these swaps. Where do you find the time???? And now opening a shop. you are amazing. L would love to go into your draw and I will spread the word. Your first fifty post have been so inspiring. Congratulations. Congratulations on your 50th blog post, I too an amazed at the amount of work you get through!Sorry your daughter is laid up but hopefully she will be up and around soon. I look forward to seeing the shop up and running and good luck with all the preparations that have to be done before the grand opening. Congratulations on your 50th blog.. well done! !The redwork cushions look absolutely wonderful, such a lot happening for you right now huh, take a big breath and I am sure that you will sail on thru. Just think how much stitching your daughter could be doing....maybe. I am looking forward to more pictures of your shop and hope your DD will get better soon. I'm so glad your shop is comming along nicely cant wait to see the end result, see you in the morning babe. 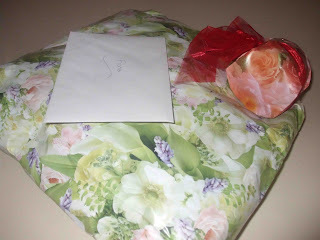 Thanks for sharing all the goodies you have sent and recieved in the swaps, Beautiful! Enjoy your weekend and hope your daughter recovers quickly - crutches are no fun. Congratulations on 50 posts. All the stitchery cushions look lovely. I hope your daughter manages the next couple of weeks well and you too. Have fun at the gathering. Best wishes for the completion of your shoppe. Count me in. I've mentioned it on my blog as well. Oh my. You HAVE been busy! Your poor DD. I can empathize with ankle problems. Congrats on your 50th post! I will post on my blog about it. I love all the beautiful stichery projects that you have made, and getting ready to open a shop, and raising a family. How do you find the time? Have a great weekend and I hope your daughter stays well rested... it is so hard at 10 to be still. Lovely. Congratulations on your fiftieth post! I am now a loyal follower...thanks for the chance to win some goodies! Please visit my site for a chance to win a giveaway. Congrats on your 50th post. I really enjoy reading your blog. Hope your daughter is ok. 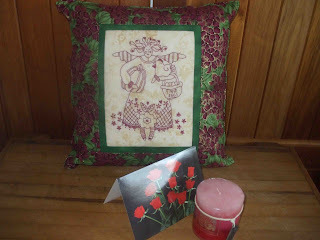 I've been viewing some beautiful redwork cushions in blogland. Looked like a fun swap. Best Wishes for a speedy recovery for your DD. All those beautiful things , swapping is great isn't it . Please add me to your giveaway . Your blog is so cute! Thanks for letting me enter. Congratulations on the 50th! Your redwork projects are so beautiful. I just love doing redwork. You gave me the incentive to get mine back out! Congratulations on your 50th post! That is a great accomplishment! Love all your work and will definately be back! Congratulations! Your redwork is lovely; such lovely swaps you put together for your recipients..something everyone would be ecstatic to have. Congratulations on 50 posts, I am a new follower and have posted about you on my blog.Enjoy the gathering. Thanks for sharing all the lovley gigts you recieved. Congratulations on your 50TH post! Congratulations on your 50th blog post, I've only just found you through Kerri.. I love redwork and your redwork is beautiful.. I hope your daughter is well on the mend.. Happy 50th post. That looks like a great prize. Just discovered your blog Fiona and it is lovely. I want to get my name in for the giveaway and then get back to reading your blogs. Congrats on your 50th post. I would have loved to been at Quilted Crows Autumn gathering. It looks like so much fun and the projects are great. Hi there, thank you for the opportunity to win your lovely goodies - I am definatelyy going to sign up as a follower your blog is gorgeous. Cograts on your 50th post! I came via Kerry's Provincial Patch and am loving the sound of your shop. Good luck with it all. Lovely giveaway! I enjoyed going through your blog (O: You make very pretty projects. Very inspiring. Hi Fiona, Congratulations on your 50th, your blog is lovely. I've been drooling over all the lovely stitchery displayed. Best wishes to your poor DD. Please put my name in your draw. Thank you. Congrats on 50 posts, what a lovely milestone!! Before you know it you will be hitting that 100 post mark! I have gladly become a follower. Congratulations on your fiftieth post! Lovely giveaway! Hi Fiona, I'm Renata, one of your overseas followers.Saw about your giveaway on "Jenny of elefantz". Your prizes are beautifull and ... I'd liked there become mine! Count me for 3 entries too because I'm going to link you on my blog! If you want I've a giveaway too, come and try your fortune. (translator on th top of the blog). Congrats on your 50th post. I'd love to enter the giveaway. It is so exciting to win something. Hope your daughter is ok.
Congratulations, on your 50th post. i am brand new in the world of blogs, i think is amazing, such talanted and lovely people to meet. Please enter my name in your give away this is my first entry ever, wish me lick. Congratulations on your 50th post. May I enter the giveaway. I read about it at Jenny's blog, "Elefantz"
Your swap are great. You receive some beautiful things and you sent out the same. You sure have a lot going on. Congratulations on your 50th post. Oh, I am also a follower! Ohhhh, supplies for another project. How wonderful. Count me in. Your poor Daughter! My Daugher broke the growth plate in her foot last year. Fortunately, they just wrapped it with a special gauze that stiffened slightly, not a regular cast. It was tough for her as she is a dancer and couldn't dance for 6 weeks! Hope your Daughter mends quickly. I just discovered your blog and can see I will love spending more time here! Congrats on your posting milestone! Congratulations on your 50th Post....well done! Thankyou for putting up the giveaway prize. Thanks for hosting the swap. You do an excellent job with your blog. So many nice things, count me in. Gorgeous stitcheries you made and received! Big hug for your daughter. Hope her ankle will be OK soon. Wow! This is a great giveaway! I love your embroidered items. 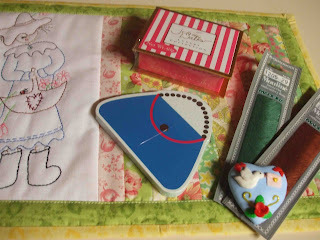 What a lovely blog you have, and you do the most amazing stitching! I hope you have many more blog entries to come!! I saw about your give away on 'Elefantz'blog. Thanks for the give away! what an awesome giveaway, thanks for sharing and count me in. Congratulations on your 50th post. Wonderful giveaway. Sign me up!!! Congratulations on your 50th! Post that is :-) Thanks for the giveaway. I'm sorry about your DDs ankle. My own DD broke her leg when she was 10 (2 yrs ago) and it seemed to take FOREVER to heal. I hope yours goes much better. I love your table runner. PS - Love your giveaway! OUCH! Hope she heals quickly! I am a follower and would like to ebter your giveaway. Looking forward to the shop opening. Congratulations on the 50th!! Thanks for a chance to win these great threads and fabrics. Great Giveaway. Love seeing all your projects on your blog! Will definitely come back again. Congratulations on your 50 post. I would love to go into your drawing.